A collage of our organization. 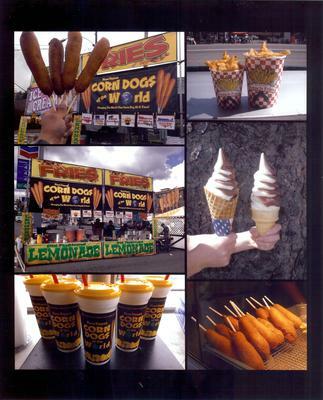 We are a concessions food company based out of Washington state. We specialize in our famous CORN DOGS of the WORLD! Hand-dipped in our homemade sweet batter and available in All-American All-Beef, Polish Sausage, German Bratwurst, Spicy Italian Sausage, Mexican Jalapeno, Irish Guinness Beer Brat, and Louisiana Cajun Hot Links. We also sell Colossal Crisp French fries, funnel cakes, soft-serve ice cream, sweet and unsweetened iced tea, and our signature Old-Fashioned Lemonade, made sweet in the way of the Old South. Please contact Jim Antram, 253-606-5952, email irishman23@reagan.com. We have participated in festivals in Washington, Oregon, California, Idaho, Utah, Nevada, and New Mexico, and would be interested in shows anywhere west of the Rockies. We would love to be part of your event!